On Friday, Debbi over at Debbi Does Dinner Healthy & Low Calorie is hosting Presto Pasta Nights. Of course, I wanted to join in since Debbi is one of my blogging buddies! I have a handful of pasta recipes already posted on the blog, but wanted to share something new for this particular blog party. Since I'm still working on a pantry challenge, I needed to work with ingredients I already had on hand. I can almost always throw together some sort of pasta dinner using items I have in my pantry. Today, I am sharing an old favorite that I prepare a little different each time I make it. I originally found the recipe for this one-pot meal in one of those little recipe books at the check-out of the grocery store. I'm a sucker for those little booklets! Not so much now, but when we lived in our apartment, I bought them pretty often. In those days, we ate a lot of spaghetti. Since I worked at the time, spaghetti with meat sauce was a cheap and easy meal that provided leftovers for several days. Making meal time easier on those busy work nights. I was thrilled when I found this recipe. A few simple changes made it easy to add variety to our almost weekly past and meat sauce night! Cook macaroni as directed on package. Drain, set aside. 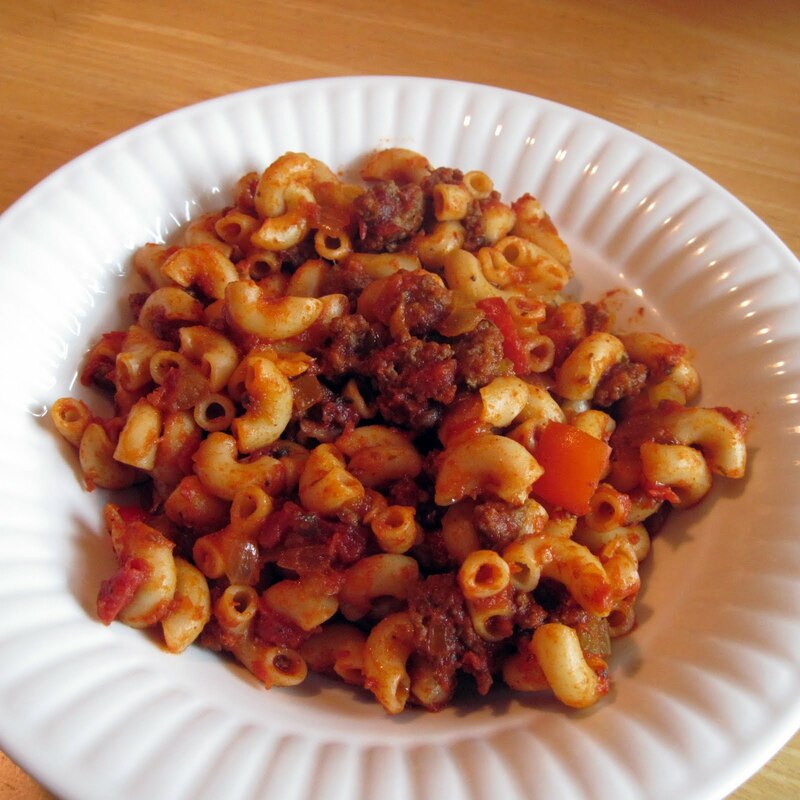 In the empty macaroni pot, cook ground beef over medium heat, drain grease. Add peppers, onions and celery to the ground beef and saute for about 10 minutes. Add garlic, spaghetti sauce, chipotles and chili powder. Use 1/4 water to get the last bit of sauce from jar and pour into the pot with the other ingredients. Bring to boil. Cover and reduce heat. Simmer for 20-25 minutes or until veggies are tender. Remove from heat and add the cooked macaroni back to the pot with the meat/sauce mixture. I love how easy and frugal this recipe is and it can be made even easier if you use pre-cooked and frozen ground beef. Simply add the frozen, cooked meat to the pan while the veggies are cooking. It's been over 4 years since I've made this meal. We both really enjoyed this and plan to add it to our menu plans more often! For dessert, we enjoyed a nice hearty serving of Chocolate Covered Banana Cake. MMMmmm! Chili Cook Off at It's A Blog Party! I love this with the chipotles! It looks awesome, thanks! I love the addition of the chipotles in adobo in this. They make anything extra tasty. I also have a favourite spicy pasta dish that is always slightly different each time I make it. What a great meal for the summer. In one pot, easy and not to much trouble. Thank you so much for sharing this great recipe with Full Plate Thursday and please come back soon! Greetings. This is my first time on your blog, but you have a terrific one. I am always on the look out for new blogs, new ideas. I especially appreciate all the details you do, so many photos makes it seem like anyone can replicate the recipe! Wordless Wednesday ~ Go Fly A Kite!